A Gold Bro is a golden variant of the Hammer Bro exclusive to New Super Mario Bros. 2. Hammer Bros, Boomerang Bros or Fire Bros will become Gold Bros when the player touches a Gold Ring. 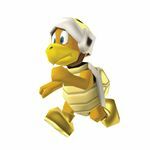 Gold Bros throw coins, rather than their usual weapons. They will only hurt the player if direct contact is made with it from above or the side. ↑ von Esmarch, Nick. New Super Mario Bros. 2 PRIMA Official Game Guide, page 36. This page was last edited on February 10, 2019, at 13:51.